Question: What do staplers, candles, and ear rings have in common? Answer: They’re among the items on display at a wacky and wonderful museum in California which claims that it has the largest collection in the world devoted to a single fruit. The International Banana Museum is one of many places around the globe where people may check out exhibits that range from the unusual to the unique, and from serious to hilarious. For starters, the Banana Museum touts itself with a pun, proclaiming itself to be “The most aPEELing destination on the planet.” Among more than 20,000 items are bananas made of glass, plastic, stone, metal, alabaster, wood and even jade. The list of articles shaped like, decorated with or reminiscent of bananas is long and, at times, surprising. It includes compasses and cookie jars, socks and squirt guns, dishes and dolls. There’s also a Banana Bar that serves – surprise! -- banana shakes, ice cream floats and other treats. For more information log onto internationalbananamuseum.com. Speaking of flavors, have you ever tasted mustard enhanced with chocolate, blue cheese or tequila? If not, you've probably never been to the National Mustard Museum at Middleton, Wisconsin. Visitors are introduced to some 5,400 mustards from all 50 U.S. states and more than 70 countries. They learn about uses of mustard as medicine, and have the opportunity to sample hundreds of mustards at a tasting bar. Staff members sing "Roll out the Mustard" and recite passages from Shakespeare which refer to the “King of Condiments.” No wonder the museum is listed on the National Registry of Hysterical Places. 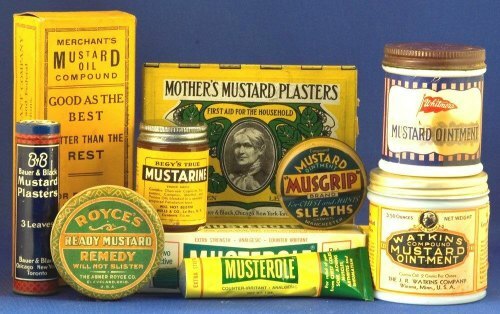 For more information, log onto mustardmuseum.com. These are but two examples of offbeat museums in the United States that attract visitors seeking something different. Other countries around the world also have their own out-of-the-ordinary offerings. For example, folks in England who like to delve into the occult may scare up some fun at the Museum of Witchcraft and Magic in Cornwall. There they can explore the history of magical practices from ancient times to the present. Images on a pewter goblet recall legends of a goddess-like figure who was a magical enchantress and megalomaniacal witch. Among the rather gruesome contents of a Haitian “magical box” are a dried toad and rabbit’s head, and a figure with a bird’s skull which is bound human hair. Among occasional events offered at the museum are plays, magic walks and, of course, special Halloween events. 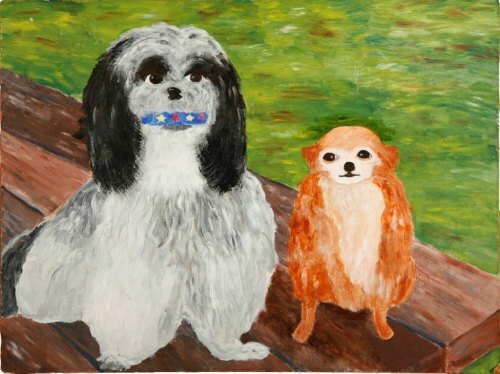 It takes no magic to figure out what’s on display at the Dog Collar Museum housed in a castle in Kent, England. The canine neckwear spans five centuries from Medieval to Victorian times. Thick iron collars covered with sharp spikes were used during the 15th-to-17th centuries when Europe’s forests teemed with dangerous predators that were happy to rip out the throat of any hunting dog that entered their territory. They contrast with delicate, ornate canine neckwear made of silver, fine leather and velvet, sometimes decorated with the coat of arms of royal owners. Animals in a different form grace the somewhat creepy Museum of Osteology, which brings to life (pun intended) the branch of anatomy which deals with bones. The museum branch in Oklahoma is home to nearly 300 skeletons that range in size from tiny mice to a 40-foot-long humpback whale. 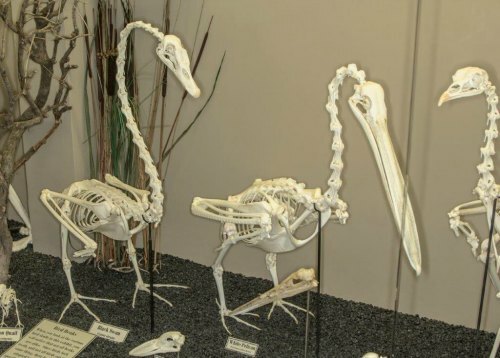 A sister museum in Florida is aptly named Skeletons: Animals Unveiled. The residents of that establishment strike imaginative poses in eerily lifelike dioramas. Much smaller life forms are under the microscope (so to speak) at the Meguro Parasitological Museum in Tokyo. In addition to operating as a research and educational facility, that establishment maintains a collection of some 60,000 parasite specimens, some of which are on public display. The themes of the exhibits are the diversity of parasites and parasites that affect humans, including those which can be transmitted from animals. Visitors with a true penchant for parasites may wish to stop by the gift shop to browse among T-shirts, cloth shopping bags, magnets and other items decorated with – you guessed it! – images of parasites. From parasites to potties seems like a natural progression so next we’ll visit the Sulabh International Museum of Toilets in New Delhi, India. It details the evolution of toilets from 2,500 BC to the present. 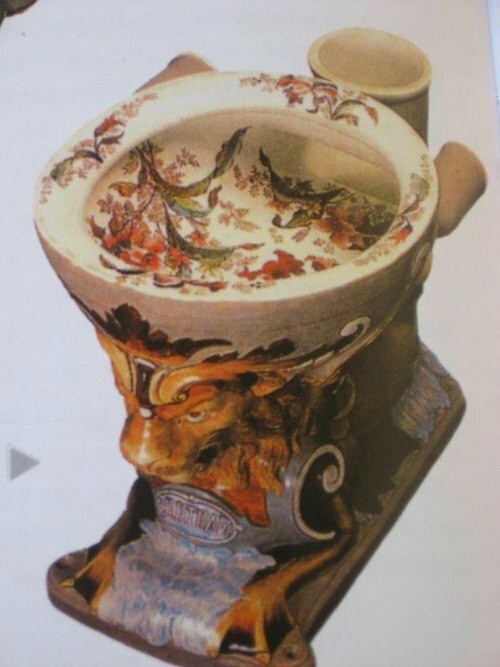 Exhibits include ornately carved and painted urinals and commodes, and introduce viewers to gold and silver toilet pots that were used by the Roman emperors and a very early flush pot which was devised in 1596 by a courtier of Queen Elizabeth I. In a nod to gentility, the collection displays poems related to toilets and their use. Furthermore, this museum is not mere flush-in-the-pan. It makes the rather grandiose claim that among its objectives are providing information to researchers, manufacturers and sanitation policy makers. People who wish to view the sculptures in two other museums need to swim in or float above a different kind of water. The Museo Subacuatico de Arte near Cancun, Mexico and the Museo Atlantico in the sea off the Canary Islands combine art with science. 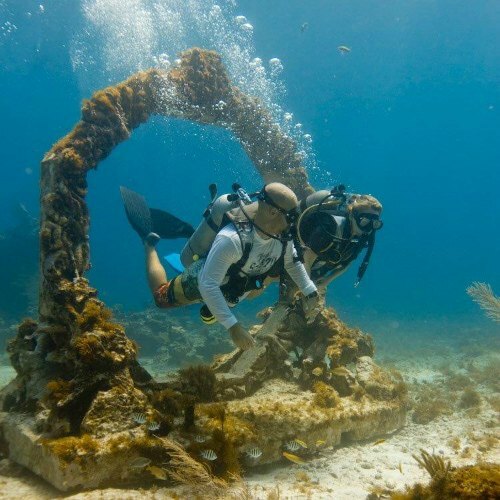 Underwater sculptures at both locations delight those who admire them while diving, snorkeling or viewing them from a boat at the same time that they create artificial reefs which help to protect the marine environment. 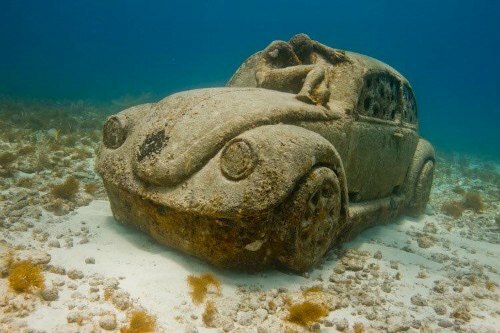 The Mexican underwater gallery includes more than 500 statues submerged between 10 and 20 feet at three locations. Among the works are the Dream Collector, the Promise, Thing Blue (a Volkswagen automobile) and six businessmen with their heads buried in the sand. Silent Evolution, the major installation, includes some 450 sculptures which show people interacting with their environment in both positive and negative ways. Each statue resembles a member of the local village where the sculptor lives including a young boy, a nun and a fisherman. The Museo Atlantico is a work in progress. So far, six groups of figures have been submerged 50 feet below the surface, and like their Mexican cousins they too resemble residents of the area. The sculptures vary from serious themes, like an image which refers to the current refugee crisis, to lighthearted scenes including a group of children in small brass boats and a couple taking a selfie. For more information log onto musamexico.org and cactlanzarote.com/en/cact/mu. Each piece in the collection is presented with an appropriate description. For example, the Blue Mushroom Man has toadstools sprouting out of the top of his head, while the aptly named Woman Riding Crustacean depicts “a blow-up doll riding a giant lobster.” If this appeals to your artistic fancy, you may log onto museumofbadart.org for more information. Mother Nature gets into the art scene at the Messner Mountain Museum, actually a network of six locations in Italy that combine some of the most spectacular scenery in Europe with explorations of various themes related to their settings. The focus of one museum is mountain myths while another tells the story of mountain people. The building perched atop 7,500-foot-tall Mount Kronplatz is dedicated to traditional mountain climbing, while the Museum in the Clouds on Monte Rite with its glass-enclosed pavilion is sensational for the panoramic views alone. Adding to its appeal is a collection of paintings of the Dolomite Mountains over two centuries. If this short list of out-of-the-ordinary museums leaves you wanting, fear not. An A (Anaesthesia) to Z (Zeppelin) choice of museums which stretches the usual meaning of that word awaits discovery around the world and, perhaps, not far from where you live.